Namcha Barwa or Namchabarwa (Tibetan: གནམས་ལྕགས་འབར་བ།, Wylie: Gnams lcags 'bar ba, ZYPY: Namjagbarwa; Chinese: 南迦巴瓦峰, Pinyin: Nánjiābāwǎ Fēng) is a mountain in the Tibetan Himalaya. The traditional definition of the Himalaya extending from the Indus River to the Brahmaputra would make it the eastern anchor of the entire mountain chain, and it is the highest peak of its own section as well as Earth's easternmost peak over 7,600 metres (24,900 ft). Namcha Barwa is in an isolated part of southeastern Tibet rarely visited by outsiders. It stands inside the Great Bend of the Yarlung Tsangpo River as the river enters its notable gorge across the Himalaya, emerging as the Siang and becoming the Brahmaputra. Namcha Barwa's sister peak Gyala Peri at 7,294 metres (23,930 ft) rises across the gorge 22 kilometres (14 mi) to the NNW. Namcha rises 5,000–6,800 metres (16,400–22,300 ft) above the Yarlung Tsangpo. After 7,795-metre (25,574 ft) Batura Sar in the Karakoram was climbed in 1976, Namcha Barwa became the highest unclimbed independent mountain in the world, until it was finally climbed in 1992. In addition to being one of the highest mountains in the world, Namcha Barwa is also the third most prominent peak in the Himalayas after Mount Everest and Nanga Parbat. 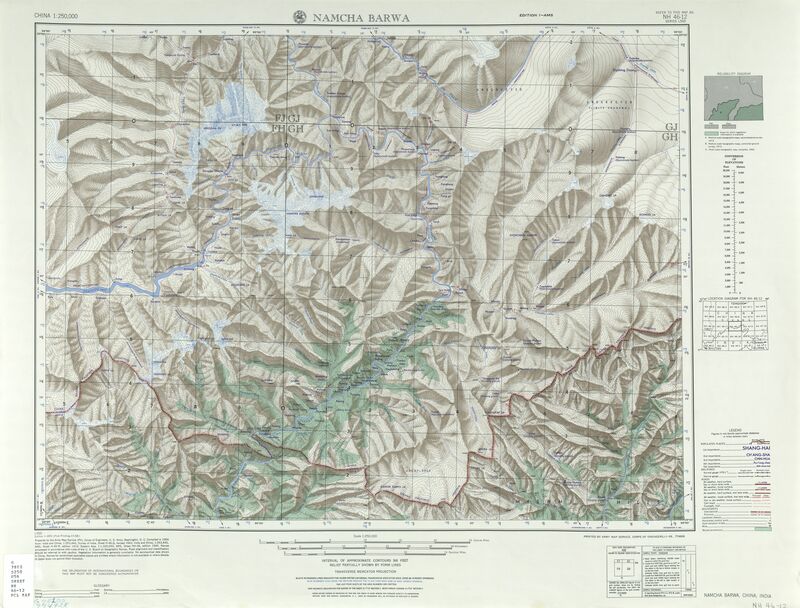 Namcha Barwa was located in 1912 by British surveyors but the area remained virtually unvisited until Chinese alpinists began attempting the peak in the 1980s. Although they scouted multiple routes, they did not reach the summit. In 1990 a Chinese-Japanese expedition reconnoitered the peak. Another joint expedition reached 7,460 metres (24,480 ft) in 1991 but lost member Hiroshi Onishi in an avalanche. The next year a third Chinese-Japanese expedition established six camps on the South Ridge over intermediate Nai Peng (7,043 metres or 23,107 feet) reaching the summit October 30. Eleven climbers climbed to the summit. U.K. Alpine Club's Himalayan Index lists no further ascents. ^ a b c d "High Asia II: Himalaya of Nepal, Bhutan, Sikkim and adjoining region of Tibet". Peaklist.org. Retrieved 2014-06-01. ^ Neate, Jill (1990). High Asia: An Illustrated History of the 7,000 Metre Peaks. Seattle: Mountaineers Books. pp. 1–4, 14–15. ISBN 0-89886-238-8. ^ "A river´s bend -- Trip to Yarlung Zangpo Canyon". CCTV-International. Retrieved 2013-10-19. ^ "HIGH ASIA I: The Karakoram, Pakistan Himalaya and India Himalaya (north of Nepal)". Peaklist.org. Retrieved 2016-03-28. ^ "Namcha Barwa" (PDF). American Alpine Journal. Boulder, Colorado: American Alpine Club. 33 (65): 285. 1991. Retrieved May 19, 2011. ^ Tsuneo Shigehiro. "China Japan joint expedition to Namcha Barwa 1992". Retrieved May 19, 2011. ^ "Shigehiro, 1992, op. cit.". ^ "Himalayan Index". London: Alpine Club. Retrieved May 18, 2011. Namcha Barwa, NH 46-12 (Map). 1:250,000. U.S. Army Map Service. 1955. Retrieved 2011-06-08.